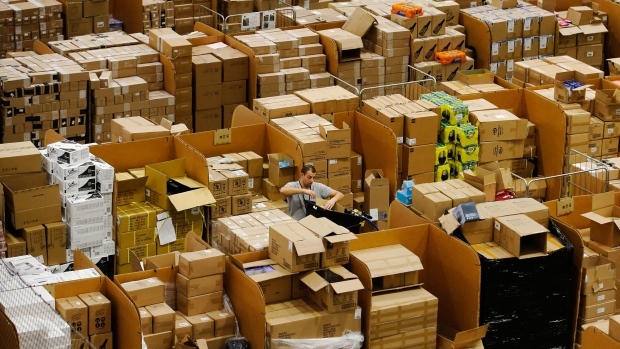 Amazon.com shares could rise nearly 30 per cent over the coming year as investors pay more attention to its “robust” earnings and margin potential, according to Societe Generale, which started coverage on the e-commerce company with a buy rating and US$2,370 price target. The 12-month target is one of the highest on the Street, according to data compiled by Bloomberg. Amazon has posted a surge in profitability in recent years. In the company’s latest quarter, it posted earnings of US$6.04 a share, up from US$2.16 a share in the year-ago period. Societe Generale expects earnings will grow at a compound annual growth rate of 32 per cent between 2019 through 2021. It also sees “strong potential to further improve margins on the back of growing scale, efficiency gains,” and developing business-to-business services. According to data compiled by Bloomberg, 48 firms have the equivalent of buy ratings on Amazon, while just one has a hold rating and one recommends selling the stock. The average price target is US$2,125.